Today's Rant: Just a quick quick post! As much as i want to share to you my DIY's stuff (tassel necklace & head dress) but unfortunately, my baby's working without me. So, instead of blogging about fashion stuff let me share to you what happened to me today. Today, we're celebrating the 10th death anniversary of our Grandma! Since I missed her a lot I have decided to buy her some candles and flowers. 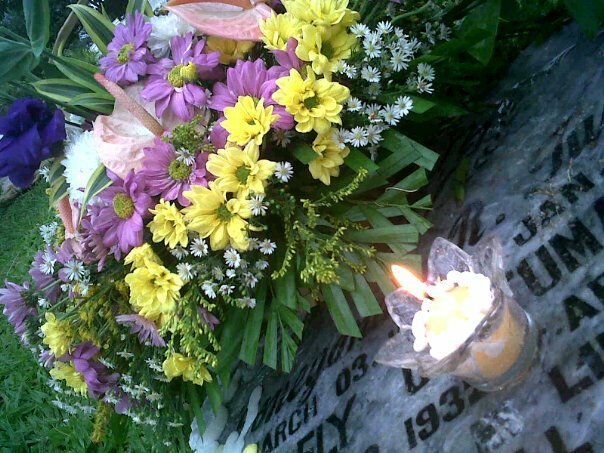 Despite of the rainy-cuddly weather, I find time to go to the cemetery to visit her grave and light a candle. I like how the flowers were arranged and the stones above the candle. Sorry for the low quality, I just took that with my celly. Anyway, She's (my grandma) one of the very important person in my life! Oh, I just remembered 10 years ago, I cried a lot because she left us before my big day but that doesn't mean I should lose hope! I realized that I should be strong and continue to enjoy life to the full! Let's don't take simple things for granted! We'll never know... That's it! Tick tock tick tock... What's your today's rant?